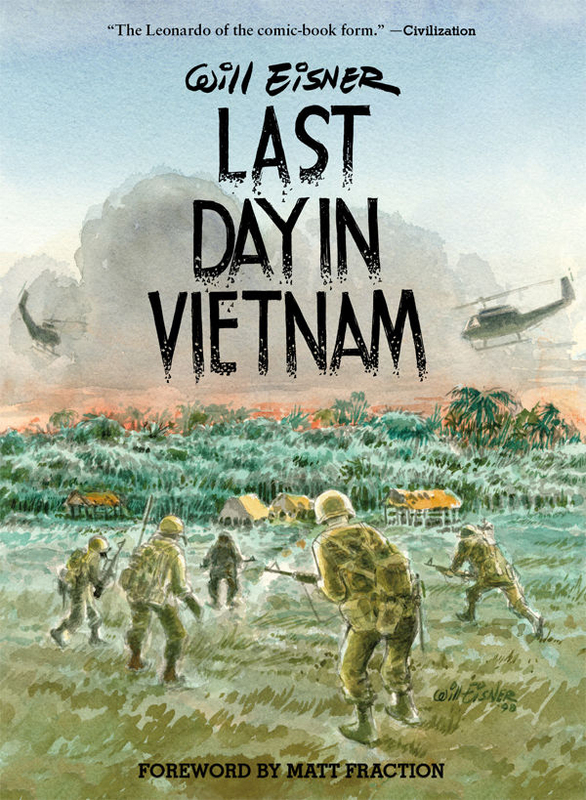 FEBRUARY 27, MILWAUKIE, OR–Next week sees the release of the brand-new hardcover edition of Will Eisner’s classic work Last Day in Vietnam. This beautiful new edition arrives in stores on March 6, on what would have been Will’s ninety-fifth birthday. In conjunction with the book’s release, there will be two Portland-based events in partnership with Dark Horse Comics and its sister company, Things From Another World, in support of Will Eisner Week, an annual celebration promoting graphic novels, literacy, free-speech awareness, and the legacy of Will Eisner. First, join Dark Horse’s editor of Eisner’s works, Diana Schutz, as she gives a special talk, “Will Eisner: Father of the Graphic Novel,” at the Art Institute of Portland on Wednesday, March 6, at 7 p.m. There will be a Q & A session to follow, some very special prizes and giveaways, and catering by the Culinary Arts program. Admission is free. Then, Dark Horse will sponsor a special reading of Last Day in Vietnam at the local recurring “Comics Underground” event at the Jack London Bar in downtown Portland. This special event will feature readings of each of the book’s stories from local comics celebrities Brian Michael Bendis, Matt Fraction, Kelly Sue DeConnick, Michael Avon Oeming, and Dylan Meconis. Erik Nebel, local cartoonist and violinist, will provide special musical accompaniment. Details can be found here: http://comicsunderground.com/. Last Day in Vietnam recounts Will Eisner’s personal experiences with soldiers engaged not only in the daily hostilities of war but also in larger, more personal combat. Some of the stories in this novel are comical, some heartrending, some frightening, yet all display the incredible insight into humanity Eisner was known for. This all-new hardcover edition includes a special intro by Matt Fraction! Premier comic book retailer Things From Another World is a proud supporter of this initiative, honoring one of the true pioneers of the sequential arts. In addition to spreading the word through their brick-and-mortar stores, they will offer a special selection of Will Eisner and Eisner Award–winning graphic novels, comics, and more at 30 percent off March 1–10 at TFAW.com <http://tfaw.com/> . Look for Last Day in Vietnam on sale in your local comic shop on March 6! This entry was posted in Columns and tagged Brian Michael Bendis, DARK HORSE COMICS, Dylan Meconis. Erik Nebel, Kelly Sue DeConnick, last day in vietnam, Matt Fraction, michael avon oeming, things from another world, Will Eisner. Bookmark the permalink. Follow any comments here with the RSS feed for this post. Post a comment or leave a trackback: Trackback URL.